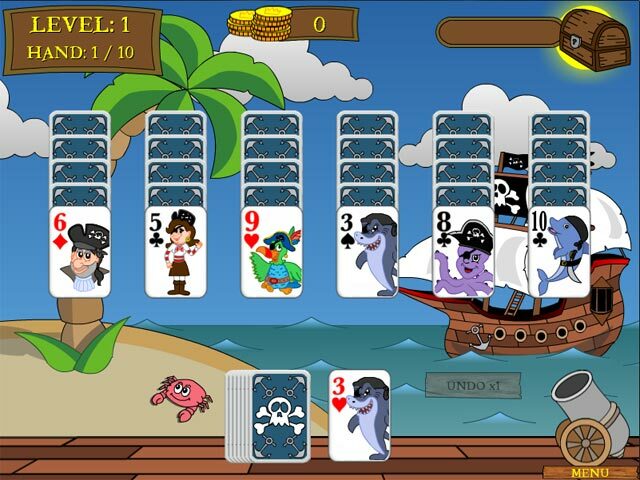 Rated 4 out of 5 by mechelle331 from pirate solitare loved it great graphics had lots of fun playing with gran kids . 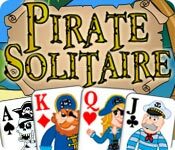 Rated 3 out of 5 by pennmom36 from Pirate Solitaire This is a fun Pirate themed Solitaire game that reminds me of Seven Seas Solitaire. This would have been an immediate purchase for me, as well as a 5 star game, but there is no option to replay the levels, making it a no go for me personally. There are 20 Achievements to earn and 3 different types of Mini Games available. 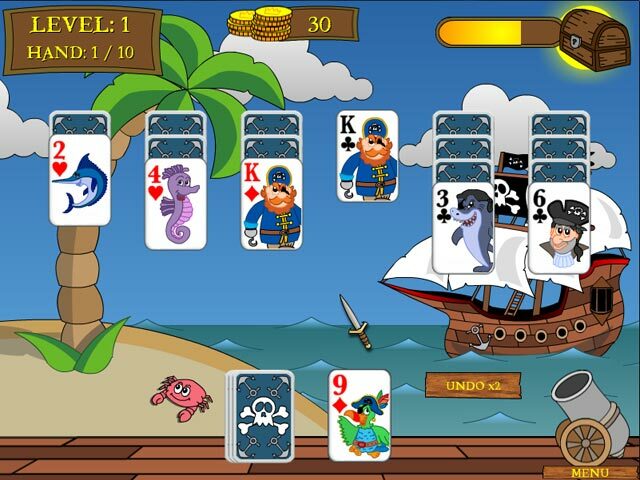 Tri-Island is a solitaire game where you move your ship to the goal by removing cards in a higher/lower solitaire game. Treasure Keeper is a game similar to "push the box" only you use your ship to push the treasure box. Snap is a Match 2 solitaire game similar to Mahjong where you remove matching card numbers regardless of suit. 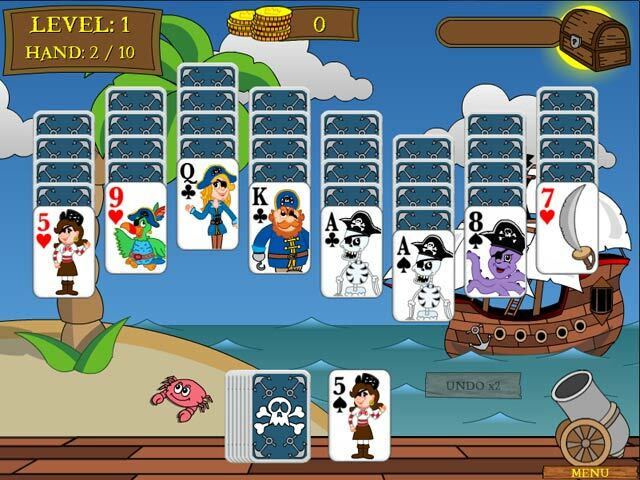 In Pirate Solitaire, the goal is to remove cards that are one number higher or one number lower than the deck card. Chain combos begin at 5 cards consecutively, which gives you a higher index on the meter for more points. Coins are released when an entire column has been removed, and you have to move your cursor over the coins to collect them. With the coins earned, you can but Cannonball Cards that are number specific wildcards. As you progress, some cards are blocked, requiring you to find the key cards to unlock such as finding a Shovel card to dig through the Sand Dune blocks. I hate it when I don't finish solitaire levels with a perfect hand of no cards remaining. I want the option of replaying the levels until I get a perfect score, and because this game doesn't give you this option, it was a fun demo, but not a game I would buy. Rated 3 out of 5 by pah45 from Cute game Cartoon graphics, pirate voice over. Music fits the game. I played the trial and I'm going to buy. Not much in the line of instructions. Cute, but not half as good as "Faeries." Rated 1 out of 5 by orochick from Don't Waste Your Money I recently bought this game because it was on special. I should have done the demo first, because I wouldn't have wasted my 2.99. This is a REALLY boring game. Level after level is the same thing. And, really easy to get perfects. You win money, but I have yet to see what you can spend it on except cannon balls (wild cards), and you don't need to buy those cause the game gives them to you. And, speaking of the money, It gets a little irritating after awhile having to "scoop" up the money at the bottom of the screen with your cursor. One of the Achievements you can earn is finishing 20 levels. Not sure how many total levels there are, maybe 30-40, but just trying to stay with the game to finish 20 may be a real achievement for me. Soooo glad I didn't use a credit!